In the running community, we come together to cope with tragedy. Next Monday, all over the country, runners will be coming together for a few miles to run. We’ll run to remember. We’ll run to forget. We’ll run to mourn. We’ll run to celebrate. We’ll run TOGETHER. NYC runners will meet Monday, April 22nd at 6:30pm at Tavern on the Green for as many or as few miles as you’d like. Wear a race shirt or the Boston Marathon colors: blue and yellow. This is as informal as it comes, so bring everyone. 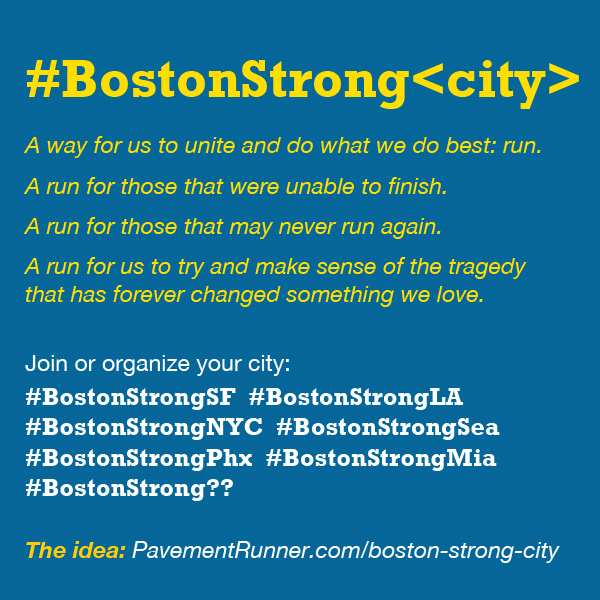 If you would like to participate in your city, find out if someone is organizing for Monday via Pavement Runner’s blog. Pingback: What We Can Do | eat. run. travel.